to make a difference in this life and change the world in your generation. And you should. All of those things are good and right and holy. So why does this concept of walking in the fullness of your divine call and destiny feel so frustrating much of the time? If you’re frustrated, it’s usually because your destiny feels completely out of reach. I understand. I get it. I’ve spent many years feeling like that; and although I no longer feel that way most of the time (because I DO feel like I’m walking in my divine call), I have to admit that even I still feel frustrated sometimes. Frustration happens sometimes. Sometimes our faith falters. Hunger is real. But it’s okay. The human thirst for more is a holy thing that GOD placed inside us. We just have to make sure we harness it and use it to compel us toward righteousness–toward the face of God–instead of letting it drag us into self-pity, doubt, and unbelief. We have to focus that hunger and use it to fuel our seeking of Father. And if we seek first the Kingdom of God and His righteousness, ALL these things will be added to us (Matthew 6:33). But you don’t have to sit around and do nothing while you wait. There are specific things you can do to align yourself correctly to receive ALL that He has for you. God’s Word tells us that there are levers that can lift us up into His call on our lives. If you are in divine alignment with certain things–if you have the right levers in place–then God can easily move you from one level of anointing, opportunity, and favor to another. Being properly aligned with the right levers raises you up through the different dimensions of your destiny. And THAT is what today’s vlog is about. In this 6-minute, 16-second video, I tell you what the three levers are that we’re going to talk about this week in the Dimensions of Destiny series. I also share a quick, visual illustration about how the levers work. So don’t wait! Watch it now, and stay tuned this week as we talk about how YOU can move into the next dimension of your destiny! Can you identify with the frustration of feeling like your destiny is far away? Are you ready to make some changes to bring yourself into divine alignment with God’s best for your life? If so, leave a comment below! Reminder: My Arise, Shine! 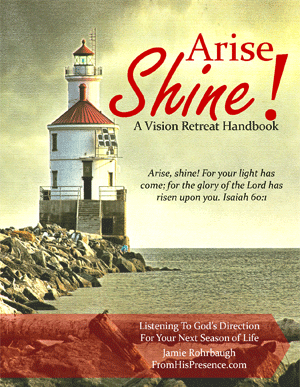 printable vision retreat handbook (with loads of bonus material) is instantly-downloadable for only $15. Arise, Shine! contains tons of teaching and exercises, walking you through an entire vision retreat so you can get heavenly downloads and directives for your new season. Click the book cover to purchase it on Gumroad! Thank you for this wonderful message. This is exactly what I’ve been waiting for. God send it to me and used you to deliver it to me.? Because of this ministry, I’m growing more in the Lord! Thank you for the explanations of the levers with the bowl and the pens and your wonderful prayer.I can’wait for your study on divine alignment.This topic about destiny is really important for me as we start the best year ever.You know this one thing everybody needs so desperately and you are a master at giving it: encouragement.You are definitely fulfilling your destiny and GOD is using you according to His will in such a powerful way.Thanks again. Thank you so much! I pray the Lord would give you great wisdom through this study and transition you into perfect alignment with His absolute BEST for your life. Thank you so much for your encouragement. It means a lot to me. 🙂 Have a great day! You are God sent,I watched the video and the way you illustrated how Devine alignment works makes perfect sense. On our way back from a night vigil on the 1st of Jan., me and a dear friend in Christ we were talking about the importence of positioning ourselves correctly to be able to receive God’s blessings. When it comes to living a purposeful life I said to my friend WHY does it have to be a mistery what we are here for,why don’t we all get a blueprint of our lives and then just get on it and do what it says and it will save us soo much time. What I got from this blog is that God wants us to seek Him wholeheartedly and then He will reveal the ‘blueprint’ to us. Now I get it that its all about devine alignments for us live the life God destined for us. Thank you and may God continue using you. Much needed for me right now, I am beginning to see some of those levers in my life. Such confirmation and help. Thank you for always allowing God to use you with what is so needed in my life and others. God is answering my prayer for a closer walk with Him and an understanding of how to accomplish my desire step by step through you. Visual illustrations are very effective, I thought you were going to pour in water and let the Holy Spirit float you up to your destiny, but you are right about people, places and things, and even if you missed them, He can restore them. with your messages, from daddy indeed there’s always profound revelations. powerful intro. Gilbert, thanks for the encouragement. I’m so glad our Daddy touched you. I pray He’d continue to give you wisdom and revelation today as you seek Him first! 🙂 Have a great day!